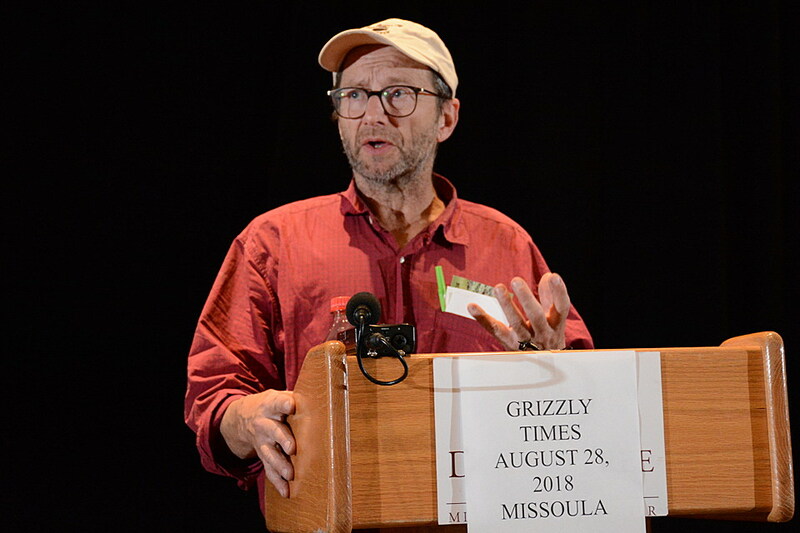 On Tuesday, Montana author Rick Bass said the grizzly bear’s plight has made him angry, but he was proud that Montana, unlike Idaho and Wyoming, held off on a hunting season. Grizzly bear advocates are descending on Missoula in advance of Thursday’s trial hearing on the delisting of the Yellowstone grizzly. 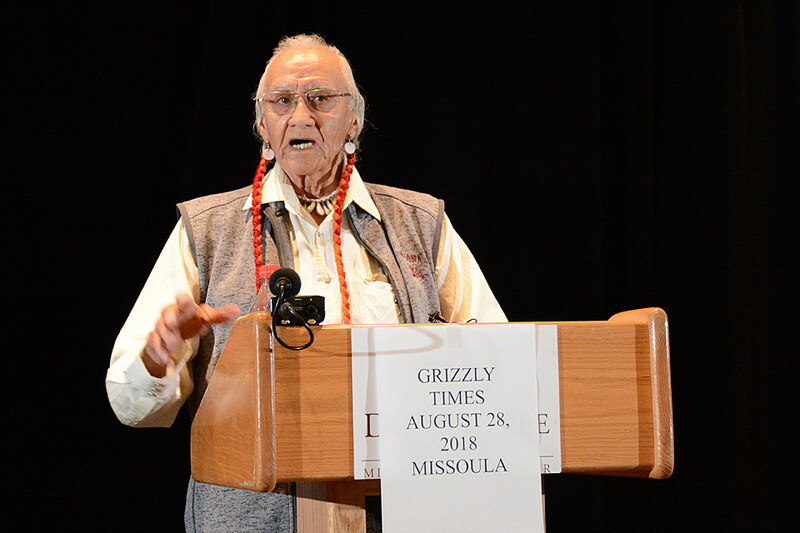 On Tuesday, at an event sponsored by the Grizzly Times, a wildlife protection group, several advocates from writers to scientists met to explain why they oppose both the delisting and Wyoming’s upcoming grizzly bear hunt. The main concern expressed was that the Yellowstone grizzly population is too small to survive for long on its own due to inbreeding, and the population is likely to get smaller because of human conflicts and trophy hunting. The estimated population is hovering around 700 bears. Biologist David Mattson said that as 90 percent of whitebark pine populations in the greater Yellowstone ecosystem have been wiped out by climate change, bears have moved from eating pine seeds to eating more meat, and that has put them in greater conflict with livestock producers and hunters. At the same time, the Yellowstone grizzly population has failed to grow. The Interagency Grizzly Bear Committee worked for a number of years to delist the Yellowstone population, declaring it recovered in 2008. But in 2009, Missoula U.S. District Judge Donald Molloy ordered the USFWS suspend its delisting and study further the effect of the loss of whitebark pine seeds from grizzly bears’ diet. Mattson’s research was integral to Molloy’s decision. Their study complete, the IGBC again prepared to delist the bear only to have Interior Secretary Ryan Zinke step in last June and declare the bear recovered. That prompted the six lawsuits that U.S. District Judge Dana Christensen will hear in a single hearing on Thursday. EarthJustice attorney Tim Preso will argue for the Northern Cheyenne Tribe, Sierra Club, Center for Biological Diversity and the National Park Conservation Association that the Yellowstone population is not stable. Also, a recent court ruling on wolves said that the Endangered Species Act does not allow the delisting of separate populations unless certain criteria are met and the Yellowstone population does not qualify. Johnny Arlee of the Confederated Salish and Kootenai Tribes said Native Americans respect wildlife and would never condone a trophy hunt. The Wyoming hunt is scheduled to start in September and up to 22 bears may meet their end if the hunt goes ahead. The Department of the Interior has asked Christensen for a quick decision so the hunt isn’t delayed. In the meantime, Deidre Bainbridge and Judy Hofflund of Jackson, Wyo., didn’t want to bet on the judge’s decision going in the bear’s favor. So they came up with the idea to apply for hunting tags, and if they were selected, they’d just take pictures. Thus, “Shoot with a Camera” was born. Out of their group, two people got hunting tags. Several tribes have joined in the lawsuit against the delisting. Johnny Arlee of the Confederated Salish and Kootenai Tribes said Native Americans respect wildlife and would never condone a trophy hunt.